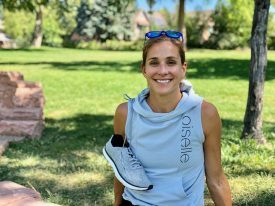 (Logan, UT – October 4, 2018) Altra is excited to announce the addition of Kara Goucher to their Elite Team of professional athletes. Goucher is one of the most accomplished female distance runners in the world. She has represented her country at the 2008 Beijing Olympics and 2012 London Olympics, and she brought home a World Silver Medal in the 10,000m from Osaka, Japan. She has many accolades ranging from the track distances to the marathon which includes the fastest marathon debut by an American woman. Goucher, who entered the master’s category at the age of 40 last July, first dominated the running scene in college at the University of Colorado where she became the NCAA Outdoor Champion in the 3000m and 5000m and the NCAA Cross Country Champion. She currently resides in Boulder with her husband and fellow University of Colorado runner, Adam Goucher, and their son, Colton. As a strong advocate of women’s running, Goucher is a believer in Altra’s Fit4Her™ technology. Altra is the only brand that makes all their women’s shoes with a female-specific last to account for the narrower heel, higher instep, longer arch and unique metatarsal spacing that women have compared to men. Goucher enjoys being a wife, mother and elite competitor, and she spends her free time inspiring women and young girls to run. She aligns herself with companies that promote women’s running and even hosts a women’s retreat. Her 2018 Podium Retreat for Women in Boulder is a weekend of acceptance and empowerment open to female runners and non-runners of all kinds. Goucher also recently published, “Strong: A Runner’s Guide to Boosting Confidence and Becoming the Best Version of You.” Goucher writes how she conquers self-doubt and improves her running. She shares tips, techniques and real-life experiences from fellow Olympic runners and sport psychologists. Next on Goucher’s schedule is to race a half marathon in November in order to gear up for a bigger fall marathon. Goucher will be at Altra’s booth at the Outdoor Retailer Winter Market in Denver on Day One, Thursday, November 8 from 10am-12pm. Stop by booth number 49041-UL to meet Altra’s newest athlete. Stay updated on Goucher’s achievements, along with all the incredible accomplishments made by Altra’s Elite and Red Team athletes by following the Team Altra Facebook page.